Add mobility to your Performance Plus Base Cabinets with these handy casters. Create your own moveable work table, so that you can take your tools with you, no matter where you need them. 4 in. general duty rigid caster. Soft rubber wheels give mobility to heavy loads on smooth hard surfaces and finished concrete floors where quiet movement and floor protection are important. Caster has a 255 lb. load rating per caster. Rigid caster moves forward and backward only. Caster attaches with a plate and four screws. Performance Series 3 in Caster Kit (4 Pack) Add mobility to your Performance Plus Base Cabinets with these handy casters. Create your own moveable work table, so that you can take your tools with you, no matter where you need them. Performance Series 3 in Caster Kit (4 Pack) is rated 4.4 out of 5 by 9. Rated 2 out of 5 by Sig from The casters looked good, but I had to return them because they couldn't be used with the cabinet... The casters looked good, but I had to return them because they couldn't be used with the cabinet I purchased. They said they went with the Bold Series of cabinets, but apparently not the one I bought. Both the casters and the cabinet had to be returned. Be careful. On the website there is a chart that shows the casters are optional with the Bold Series. But they cannot be used on the larger cabinets. Rated 5 out of 5 by Joseph from Ii Love the cabinets and the casters, the whole deal... Ii Love the cabinets and the casters, the whole deal was awesome! Great quality, super easy to install. My garage was transformed quickly into a garage to be proud of!! Rated 4 out of 5 by Stan from These are very good casters but will not fit the large New Age cabinets due to lack of holes. New... These are very good casters but will not fit the large New Age cabinets due to lack of holes. New Age does not recommend casters for the large cabinets but only in the Q&A. I returned mine & changed my configuration. 4 stars only b/c of this. Rated 4 out of 5 by Jay from Good product but a little pricey. Good product but a little pricey. Rated 5 out of 5 by Chuck from Fit, work great I wanted to turn my New Age bottom cabinet into a rolling toolbox. These casters seem well made, fit the mounting holes in my cabinets perfectly. Rated 5 out of 5 by Bobbie from Fit perfectly. Bought two sets to add mobility to the cabinets. Work well. 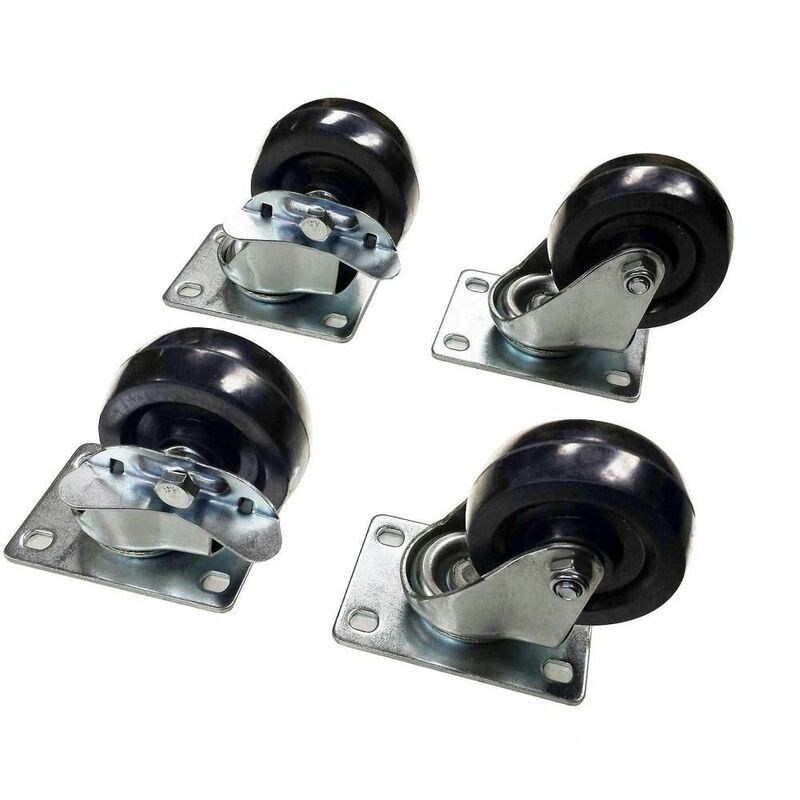 Will these casters fit on the New Age outdoor stainless steel 2-Door and 3-Drawer kitchen cabinets ?? Hello David, the above mentioned casters are specific to the garage cabinets however, if you search for Model # 65850 | Store SKU # 1001025797, these are compatible with the outdoor kitchen cabinets. If you have any further questions feel free to email us or call us at 1-877-306-8930 option 4 and we would be more than happy to assist you.